Marketing teams get creativity. Creativity is their life’s blood. The concern is that by setting up rules and processes, we might kill that creative spark that drives the art created by the marketing directive. Agile methodology is applying the art of science in order to uncomplicate and reduce unnecessary admin time -- the very thing that keeps us from spending more time making beautiful campaigns and generating innovative copy. We’re going to talk to real life marketing teams who are using Agile methodologies to run their right-brained collaboration space – and are seeing tremendous results. We’ll talk war stories, great use cases, and ways to break down the siloes that are keeping your brilliant minds from making that next inspired leap. 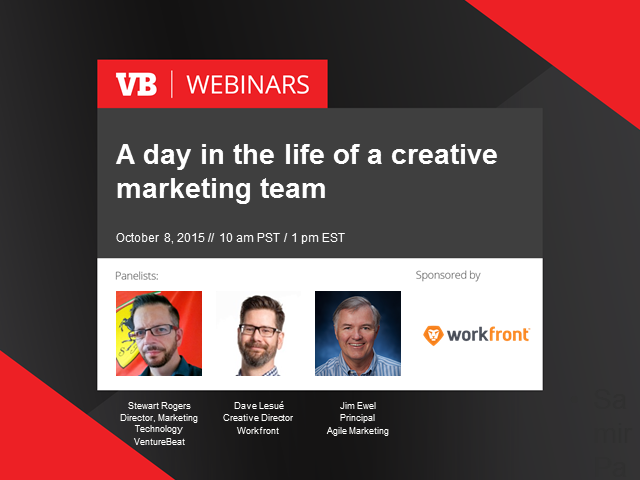 Join us for a free web event sponsored by Workfront to uncover the real-life ways that creative directors are harnessing the power of agile marketing methodologies to rapidly make fantastic leaps and discoveries that fuel careers. * Use data to analyze and capitalize on changes in projects, marketing and industry trends… before your competitors know what hit ‘em. * Capture the lightning in a bottle that ensures amazing customer experiences.